The first modern world map incorporating a comparative mountains and rivers chart. Gray's New Map of the World in Hemispheres, with Comparative Views of the Heights of the Principal Mountains and Lengths of the Principal Rivers on the Globe. This is a beautiful example of Frank A. 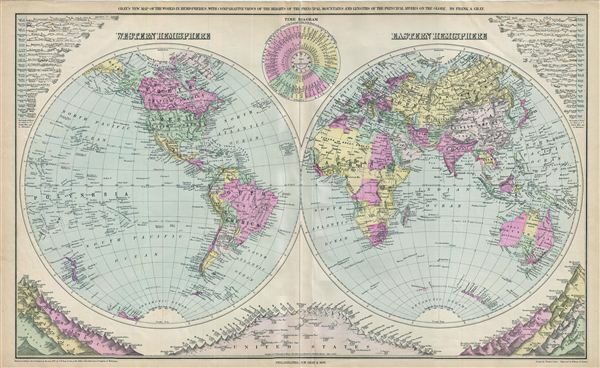 Gray's 1879 map of the world on a hemispherical projection. This map is significant as, in addition to a world map, it must be considered the first modern comparative mountains and rivers chart. Gray combines Mitchell Jr.'s hemispheres into a single global double hemispheric projection and incorporates correctly scaled comparative data in each of the map's corners. The advantages of this system are obvious, for not only does Grey offer comparative data isolated hemispherically, he also places each in such that it can also be compared globally. Possibly pandering to his audience, Gray also incorporates a center weighted chart that details the peaks of the United States. Subsequent comparative mappings of the world's mountains and rivers generally follow the Gray model. An interesting time diagram near the top center margin indicating the local time in the fifty principal cities of the world, while noon in Washington. The Antarctic continent is shown only sketchily, representing the relatively primitive state of Antarctic exploration in 1879. This map was drawn by Frank A. Gray and engraved by William H. Holmes. Dated, copyrighted, and entered according to Act of Congress, in the year 1879, by O. W. Gray & Sons, in the office of the Librarian of Congress at Washington. Ormando W. Gray (fl. 1860 – 1880) was a mid to late 19th century map publisher with offices in New York City, Philadelphia, PA, and Danielsonville, Connecticut. He was trained a civil engineer and surveyor. Gray's first commercial atlas was an 1869 survey of Windhamd and Toland counties, Connecticut. His most important work seems to have been done in conjunction with other, more prominent map publishers, including Henry Walling and G.W. and C.B. Colton. Gray is best known for his state and county atlases, though did, with his sons, also independently issued at least two national atlases in the late 1870s. Gray, F., Atlas of the State of Maine, (Philadelphia: O.W. Gray and Sons) 1879. Very good. Original centerfold visible. Minor wear along top and bottom edges.